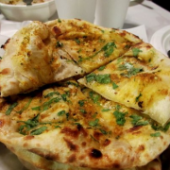 Onion Naan | Indian Restaurant in Courtenay and Nanaimo. Genuine Indian and Asian food. Eat in, take out, get delivery. White bread cooked in a clay oven with onions and cilantro.